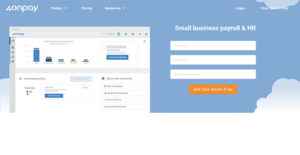 OnPay is an easy-to-use yet comprehensive payroll software that provides scalable solutions for small and medium-sized businesses. This cloud-based service streamlines payroll processes and automates tax filing and payment workflows. Entering payroll information such as hours, tips, reimbursements, and bonuses are done seamlessly. It also incorporates other responsibilities including benefits (health insurance and 401(k) retirement) and compensation insurance for pay-as-you-go workers. It’s one of the most affordable and cost-effective solutions in the niche as it takes care of unlimited payroll runs for W-2 employees and 1099 contract workers monthly. It offers payroll through check or direct deposit. However, direct deposit is not available for all employers. Only those who apply for the feature and pass the risk assessment conducted by OnPay can use it. Handling payroll taxes is also optimized by the software as it calculates your state and federal payroll taxes. They do the withholding, tax payments, and filing of tax forms. OnPay abides by its accuracy guarantees which means they will take responsibilities if there are any errors in the tax filing. While others find it too basic, it’s also one of the software’s strengths because it’s able to deliver its core services straightforwardly and effectively. This is evident in its clean UI that is filled with only the essential tools. It’s also cost-efficient for it bundles its service packages based on the number of employees. With key features like employee management, payroll compliance, and HR tools, OnPay delivers in terms of effectiveness and value for money. Online Access and Employee Self On-boarding enable your employees to enter their own personal data, make changes, and retrieve their own paystubs and tax forms. This saves your time so you can focus on your high-level tasks. If you have new hires, the software provides a checklist and notifies you of reporting needs and documentary requirements for the government. Employees have Lifetime Accounts which means even if they’re no longer working for you, they can still access their pay stubs and W-2 forms online. It caters to a wide range of employee types including contractors, salaried employees, hourly workers, tipped workers, and agricultural workers. Handling special tax filings for nonprofits and clergies are also covered. Furthermore, it streamlines paying wages through various methods such as direct deposit, pre-paid debit cards, and checks. One of the software’s most valuable features is allowing unlimited pay runs. It’s the software’s endeavor to allow businesses to run their payrolls according to their arrangements without having to face extra charges. This includes making corrections and canceling a pay run. Information inputted by your employees is saved in a vault so there will be no need for time-consuming data entry. The fast-loading and user-friendly interface is designed to let you process your payrolls quickly and conveniently. OnPay has been in the business for three decades so they already know the dos and don’ts in handling payroll taxes. They take care of IRS and your state when running payroll, calculating taxes, paying them, and filing all tax forms. In fact, they have faith in their platform not to make errors that if they mess up, they pledge to be held liable and cover the fines for you. For any questions, they offer Certified Payroll Professionals whom you can call from 9 AM to 8 PM ET on weekdays to handle and answer your inquiries so you’ll avoid inaccuracies and oversights in your payroll taxes. Storing documents and taking notes let you stay on top of your payroll tasks. OnPay enables advanced note-taking with image and document attachments. Users can also add comments, edit, and format the notes. Furthermore, you’ll gain access to an online HR library where you can obtain employee handbook templates and employment laws by state. It also consists of onboarding and offloading, annual reviews, and performance plans, among others. You can also track accrued time with ease for 3-tier PTO, sick, and vacation accruals. It has an unlimited number of policies and three-time periods for every policy. Administer health insurance benefits with OnPay’s nationwide availability. You’ll be working with licensed insurance brokers to help you understand the benefits better, especially when it comes to the medical, dental, and vision offerings. Since it’s integrated into the payroll, calculating for it is streamlined. You’ll also have the option to choose plans from different price points that work well for your company and your employees. Researching and generating quotes are available at no additional fee. 401(k) is a retirement plan that’s funded through pre-tax payroll deductions. OnPay lets you have an integrated experience by automating withholdings equipped with secure harbor plans and contribution matching. Investment management is done for free. Your employees are also given 401k(k) onboarding and education to let them understand better this special type of account and how it benefits them. OnPay has an inexpensive price point for their subscription plans while not neglecting on features with a multitude of integrations and government compliance. It’s also scalable when your business grows which lets you only pay for features that you actually need at a certain time. It doesn’t charge fees for changing plans, cancellations, annual fees, direct deposits, debit cards, and personal check printing, and withholding, remitting, and filing payroll taxes. What Problems Will OnPay Solve? When someone’s setting up payroll for the first time, there can be a lot of questions and a lot of false starts. OnPay offers to enter employee data and walk new customers through the payroll process. Personal attention from US-based certified payroll professionals makes getting up to speed simple, and then the provider sends reminders for every pay run, and automates all the rest of the tough stuff. Cancellations and multiple payruns are free, so there’s even room to make mistakes without incurring added expenses. An expert is available by phone from 9:00am ET to 8:00pm ET. OnPay is designed to help businesses scale. In addition to a responsive support team and its error-free guarantee, OnPay offers the flexibility to grow with a small business. Businesses can pay salaried employees, 1099 contractors, or hourly workers. They can organize their payroll into multiple locations or even serve multiple states. Businesses can utilize multiple pay cycles, set up and track vacation and PTO accruals, and ask new employees to self-onboard through OnPay’s employee portal. The payroll admin is simple to search, OnPay integrates with other top cloud-based HR software, and adding on benefits just requires a quick call to OnPay’s in-house licensed benefits brokers. A lot of businesses stick with a mediocre payroll provider because they feel like switching will be worse than the pain of staying put. OnPay enters all your employee data and wage history for you (for free). If anything falls through the cracks, their certified payroll professionals are available by phone to help get things right, and OnPay offers an error-free guarantee on its tax filings. OnPay’s great pricing can mean significant savings over legacy providers, and there are very few businesses that won’t find their needs met by OnPay’s platform. OnPay even offers fully customizable reports and robust software integrations to make payroll a seamless part of the P&L. Since each enterprise has unique business requirements, it is sensible for them to desist from searching for a one-size-fits-all ideal software application. Needless to say, it would be useless to try to find such a system even among widely used software solutions. The clever thing to do would be to jot down the various essential elements that need consideration such as key features, budget, skill levels of staff members, company size etc. Then, you should do your groundwork thoroughly. Read some OnPay reviews and look into each of the other systems in your shortlist in detail. Such in-depth research can make certain you weed out ill-fitting applications and zero in on the system that presents all the aspects you need for business success. How Much Does OnPay Cost? We realize that when you make a decision to buy Payroll Software it’s important not only to see how experts evaluate it in their reviews, but also to find out if the real people and companies that buy it are actually satisfied with the product. That’s why we’ve created our behavior-based Customer Satisfaction Algorithm™ that gathers customer reviews, comments and OnPay reviews across a wide range of social media sites. The data is then presented in an easy to digest form showing how many people had positive and negative experience with OnPay. With that information at hand you should be equipped to make an informed buying decision that you won’t regret. An excellent app bundled with great support. A great payroll to have in any small business. If I could turn back time, I wouldn't hesitate to choose this. This tool was great for my small business. What are OnPay pricing details? What integrations are available for OnPay? Pros: OnPay may just be that cheaper option for payroll management. Quality is first class. Being a bookkeeper, I've been using their service for a number of clients the past few years. I like how their reporting options work. It's simple enough to follow and offers flexibility that I need. Their customer service is fantastic regardless if it's asking help through online chat or over the phone. Cons: I'm annoyed from time to time looking up information that I need and utilizing the site to build anything new. Wish they could do something about that to make it easier for folks like me who want information pulled out in a matter of seconds. Pros: I'm running a small startup. I've been making use of OnPay for a few years now. The app is simple to utilize and is straightforward. The greatest thing with the app is their customer support. I was able to resolve all my issues by talking to someone over online chat. Businesses out there should take a good look at OnPay. Cons: At the moment? Nothing. I favor just about everything with OnPay. The one teeny downside was that I wasn't able to use it much and I still had to pay for it. I'd be happy if I give myself a break and not worry about having to lose all my data. One of our company's most valuable assets. Setup and payroll runs has never been this quick. A superb software to have. Small businesses should make this their payroll partner. If you need more information about OnPay or you simply have a question let us know what you need and we’ll forward your request directly to the vendor.